Bill Ayers: Domestic Terrorist or American Hero? With all the recent controversy regarding Barack Obama’s association with former Weather Underground founder Bill Ayers, I decided to do a little research on Mr. Ayers, something the media seems reluctant to do. Who was and who is Mr. William Ayers now? If you go back to the 1960s, you will discover that Bill Ayers was one of the people who restarted the FREE SCHOOL movement, a revolutionary concept in education. (We have revived the Free School movement right here on HipForums!) Bill was very concerned about our education system and how it was turning out people to become corporate robots and ideal consumers. So Bill started the Children’s Community, a Free School project in Michigan to offer an alternative to the state required public education. Here is an article I just posted to the Hippyland Archives about Bill Ayer’s contribution to the Children’s Community. So as you can see as far back as 1968, Bill Ayers was an Education activist, focused on the education of minority students. Obviously he shares this interest with Barack Obama, and that is why they know each other. Right after this article was published, Bill Ayers had to go underground. This was because the group he founded, the Weather Underground, had just blown themselves up in a Greenwich Village townhouse while manufacturing bombs. Bill himself has revealed in his autobiography, Fugitive Days: A Memoir published on Sept 10th, 2001 (the day before the WTC attack on 9/11), that he had indeed participated in bombing the Pentagon, the US Capitol building and NYC Police Headquarters! Yet Bill had all charges dismissed because he was under investigation by COINTELPRO, an illegal spying operation run by the US government. (Today the gov’t can do exactly the same sort of spying, but it’s now legal under President Bush). Ayers was also active in the Weatherman’s 1969 Days of Rage riots in Chicago, where 300 weathermen protested the war in Vietnam via violent acts. It was only the most violent protests such as this that got media attention. So my question is this: IS Bill Ayers a Domestic terrorist or an American Hero and freedom fighter? Terrorists target innocent civilians randomly. Bill Ayers and the Weather Underground did not target randomly. They attacked government symbols of the War in Vietnam after careful consideration. The most radical elements during the 1960s showed the American public that the government had crossed the line during the Vietnam War. The line being the point at which Americans would no longer tolerate government sponsored VIOLENCE against human beings (wherever they lived). To drive that point home, these radicals used violence themselves. In other words until Americans witnessed violence in their own country, they would not understand the impact that squadrons of B-52s carpet bombing Vietnam, Cambodia and Laos had upon the innocent people in those countries. It was about bringing the war HOME to those who supported it. This was an important issue, especially for liberals and hippies to understand. Most were peace-loving, non-violent types who could not condone the violent actions of the Weathermen and others. But as today’s new cycle proves, unless you do something so radical as bomb gov’t buildings you won’t get the media’s attention to your cause. It was true then and it is even more so now. The thing that all the peaceful protests seemed to be unable to do was end the war itself. But the threat of domestic violence by those who wished to end the war really brought home the fact that Americans would no longer stand idly by while the US gov’t pursued it’s inhumane imperialist policies. And finally all the ruckus drummed up by the 60s activists is the main reason why YOU and following generations were never drafted into the armed services. Even conservatives now acknowledge that the American public won’t stand for a draft for an imperialist war. That is something that these radicals from the 60s impressed upon the nation. So in conclusion, the actions of Bill Ayers, the Weather Underground and others helped turn the tide against the war in Vietnam, helped rid the US of the draft, and probably saved thousands if not hundreds of thousands of lives, American and foreign. Is that not the definition of a hero? Hip Trip: Philosopher, poet, cannabis activist, former soft drug smuggler. Grooves on: fine clothes, good company, red wine & black hash. Amsterdam has always been a refuge for those whose politically incorrect ideas have exiled them from their home country. A few of these include Rene Descartes, Voltaire and Karl Marx. Today, Amsterdam is awash with a new wave of ex-patriat artists and writers seeking literary and creative freedom in the aftermath of 9/11. The scene here is reminiscent of Paris in the 50’s when Hemingway and Gertrude Stein held court in cafes and private salons. Today’s refugees seek solace and fellowship in Amsterdam’s numerous brown pubs and smoke filled coffeeshops, where Alice B. Toklas would’ve felt at home. So it was no surprise when I finally met Lee Bridges, a man whose life and art revolves around such establishments, at the Greenhouse Coffeeshop. Here I found a soul brother. A man who feels the inspiration and creative energy permeating Amsterdam’s more famous cannabis hangouts. Lee, dubbed the Cannabis Poet by those who recognize his unique contribution to both poetry and cannabis activism, is quite a character. On the Amsterdam scene since the early ’60s, Lee bridges the gap between the last great wave of writers, philosophers and artists with the new wave, recently arrived. At age 74, he is well respected by much of this younger generation. Born in Georgia, Lee took off to the big city, New York, in the 1940s, as soon as he could, to dig the scene happening there in those Post WWII days. He hungout in jazz venues occasionally playing sax & clarinet in jam sessions around Harlem. Later, Lee traveled around with a big carnival band. Lee went to night school to study English & creative writing. 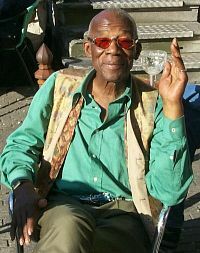 He found himself broke in Amsterdam in 1963, so he started doing poetry readings in the cafes. Later, in Paris, he formed a group called Contacts which combined Lee’s poetry with background music and a folksinger who sang during the breaks. Lee loves to talk story and will tell you about his vagabond youth and his drug smuggling days back in the 70s, with tales from India, Pakistan and Afghanistan that harken back to the golden age of hashish dens along the famous hippie trail. Lee has been caught smuggling hashish into Europe and spent time in a French jail as a result. With those days far behind him, he can now recall them without fear or worry that he might get into trouble. He’s a man who’s paid his dues, and now demands respect and tolerance. And living in Amsterdam, surrounded by friends he gets plenty! Lee is an elderstatesman among the cannabis set. His 55 years of cannabis consumption haven’t dulled his wit nor his sense of humor at all. In fact, his regular use of the substance keeps him focused on the beauty of the moment. Like a skinny, black buddha, Lee’s presence has a subtle influence on those around him. His beautiful resonant voice draws you in then whisks you away on an exotic, mesmerizing journey. His stories easily capture the imagination of the stoned, while his poetry reaches into every soul’s sense of wonderment and revelation. Lee is fond of saying WWWHHHOOOoooeee!, which pretty much sums up his perceptions of life’s dark alleyways as well as it’s breathtaking beauty. Like Allen Ginsberg (his contemporary in NYC), Lee Bridges sees life as a stark reality of desire and despair occasionally mitigated by peace and contentment. Yet, like Buddha, he knows it’s all in your head. His outspoken opinions on cannabis use, as a social and spiritual phenomenon, makes him an activist if not an outright promoter of the plant. Lee sees cannabis as a bridge to finding your true self, and as a non-aggressive alternative to alcohol consumption. His strongly held convictions are echoed in his poetry. His Amsterdam poetry is evocative, yet gritty. Lee plays with the city’s urban contrasts like sinful pleasures and junkie despair. Yet his love of the city and it’s people comes blazing through the wet and gray. 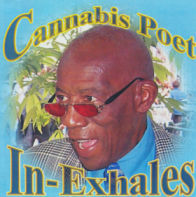 The Cannabis Poet is that rare combination of artist, activist, humanitarian and philosopher who finds inspiration and beauty even in life’s darkest corners. 2. Oh Amsterdammers! Oh Amsterdammers!